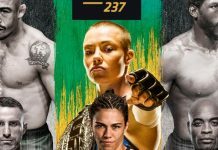 A women’s strawweight title fight rematch between current division champion Rose Namajunas and former title holder Joanna Jedrzejczyk served as the co-main event of tonight’s UFC 223 fight card in Brooklyn, New York. Round one begins and Jedrzejczyk comes out quickly. She fires off a left that misses. Rose paws with hr jab but eats a low kick. Namajunas is using a lot of movement early. Joanna misses with a left hook. Rose comes over the top with a right hand. She circles out. Rose is moving in and out of the pocket. Joanna is having trouble finding her range. Rose fakes a low kick and then comes in with a right that just misses the mark. Joanna with a nice low kick. Rose leaps in with a left jab that finds a home. A very tentative start from both women here. 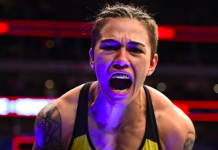 Rose with a leg kick and Joanna just misses with a right hand. Both fighters connect with jabs. Joanna with another nice low kick. She presses forward but Rose answers with a snapping right jab. Joanna again with the low kick. Rose circles and then leaps in with a front kick. Namajunas with a big right hand. That tagged Joanna. Jedrzejczyk retreats and Rose comes forward with a nice right hand. A follow up leg kick lands for the champion. Rose goes to the body with a jab. Joanna answers with a straight right. Rose lands a left jab. She follows that up with a big left hand. Round one comes to an end. Round two begins and Rose lands a nice combination. She follows up with a stiff jab. Joanna misses with a hook and then eats a left for her troubles. Joanna is circling on the outside now. She is having an awful time trying to get inside. Jedrzejczyk with a pair of heavy low kicks. Rose just continues to press forward. She lands a big left hand. Joanna fires off a combination that misses. She attempts a front kick but it fails to find the mark. Rose with another good combination. She presses Joanna against the fence. Joanna breaks free. Jedrzejczyk says she was poked in the eye but the action continues. Rose ducks under a punch and counters with another nice left hook. Joanna is swelling up. Jedrzejczyk with a combination that ends in a low kick. Rose charges forward and presses her against the cage. Ten seconds remain. Round two comes to an end. Round three begins and the fighters touch gloves. That was unexpected. Joanna lands a leg. Rose with a big punch but Joanna smiles and says she is ok. Namajunas goes to the body with a jab. Joanna circles out. She steps in with a hard inside low kick. Rose backs off for a second and then lands a right hand. Another good low kick from Joanna. Rose lands a jab to the body followed by a right hand over the top. She follows that up with a front kick attempt that just misses. Joanna lands a low kick and then goes high. This is getting good. Rose with another left jab that lands. Both fighters trade punches in the pocket. Jedrzejczyk with back-to-back low kicks. She lands another. This could be winning her the round. Rose shoots in but can’t secure the takedown. One minute remains in round three. Rose with a nice left hook. Joanna replies with one of her own. The ladies exchange kicks now. 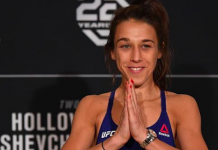 Joanna with a low kick and then a right hand over the top. Rose with a kick to the body. Round three comes to an end. Round four begins and Rose starts off quickly. She lands a left jab and then just misses the mark with a right hand. Joanna with a heavy outside low kick. She follows that up with a nice crisp jab. Rose retreats and eats another low kick. Namajuna circles and then comes forward with a combination. Joanna replies with another good low kick followed by a left hook to the body. Joanna with another hard low kick. Rose responds with one of her own. 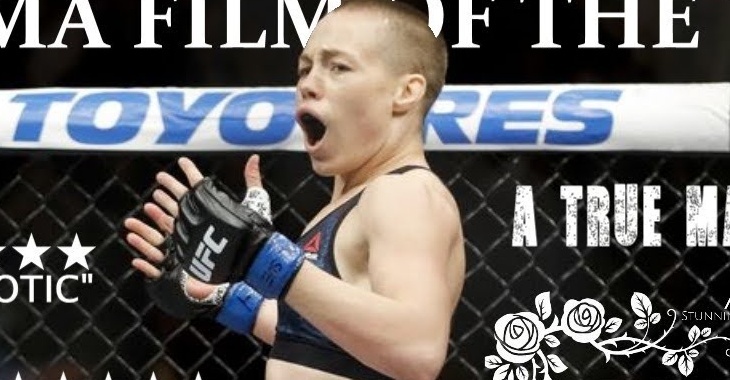 Namajunas circles along the fence and then leaps in with a right hand. Joanna returns fire with a left hook but it misses. Another left from Joanna finds a home. She lands a chopping low kick on Rose. Namajunas appears to be slowing down. Rose catches her with a left hook. Joanna returns fire with a low kick that wobbles Rose. The tide has definitely turned here. Just over one minute remains. Rose with a big right hand. Joanna again smiles but she is wearing that damage. Rose just misses with a front kick. Rose lands a nice left. 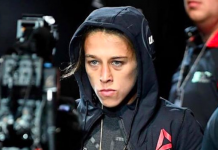 Joanna returns fire with a pair of low kicks. Round four comes to an end. Round five begins and once again the fighters touch gloves in a show of respect. Joanan lands a low kick but Rose counters with a right hand. She steps in and lands a big left hand. Rose with a low kick and then a right hand behind it. She has started quickly in the final round. Another good jab from Rose. Joanna leaps in with a combination that misses. Rose with a right hand. She lands a chopping low kick. Rose with a left hook. Joanna is wearing the damage now. Huge uppercut from Rose. Joanna fires off a low kick. Rose with another right hand. Joanna returns fire with one of her own, Both ladies seem happy to stand and bang in the pocket. Joanna misses with a front kick attempt. Ninety seconds remain. Joanna with a left jab but Rose counters nicely with a jab of her own. Joanna misses with a head kick. Rose shoots in and scores a late takedown. That was huge. That likely won her the fight. We go to the judges!